El Paso Holocaust Museum Study Center invites you to participate in our curriculum trunk program. 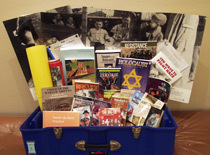 These trunks are designed especially for use by elementary school, middle school and high school educators to assist them in teaching not only the historical facts relating to the Holocaust but, more importantly, the lessons of prejudice awareness and the consequences of apathy. All trunks are a compilation of multi-media tools including videos, photographs, classroom sets of books, lessons plans, and student activities. Each curriculum trunk is designed to be age-sensitive and aligned with state standards. Trunks can be checked out from EPHM for up to 6 weeks. A letter from a school administrator authorizing teacher’s use of an EPHM Curriculum Trunk is required at time of check-out, as well as a check or credit card number for insurance purposes only. Fines can be charged if trunk is not returned or is returned with any materials severely damaged. How long do you plan to borrow the trunk? How do you prefer to be contacted about reserving your trunk?